With the Galaxy Note 7 all set to be launched in just a few days, the next major offering from Samsung has to be the highly anticipated Tizen based Gear S3 smartwatch. The smartwatch is expected to be unveiled at IFA, Berlin 2016 this September. There will also be a ‘super-luxury’ edition of the Gear S3 to follow the feat later on in 2017. We recently came across a few leaked images of the smartwatch giving us a glimpse of what it would look like. Now, Brian Conroy a corporate solicitor has spotted a Korean trademark filing with the term “Gear S3 Frontier” in the KIPRIS database (Korea Intellectual Property Rights Information Service). The ‘Designated Goods’ section under the trademark describes it as “Mobile devices, namely, smartphones in the shape of watchbands namely, wearable digital electronic device comprised primarily of software and display screens for viewing, sending and receiving texts, emails, data and information from smart phones, tablet computers and portable computers and also featuring a watchband” and “Smart watches to make mobile payments”. Samsung has come a long way since the idea of mobile payments was born and might be looking to perfect it with the Gear S3 and Samsung Pay. Samsung Health is another service expected to get a huge boost with the upcoming wearable device. A couple of our internal sources have also hinted at the Gear S3’s SDK to have full support with its rotating bezel hardware which has been highly regarded on its predecessor Gear S2. The Gear S3 is also expected to carry a larger display thanks to numerous user feedback against the smaller 1.2 inch circular display on the Gear S2. A larger display will most likely ensure a larger battery and we hope that could juice up the Gear S3 for a bit longer than what we have come to see on the S2. 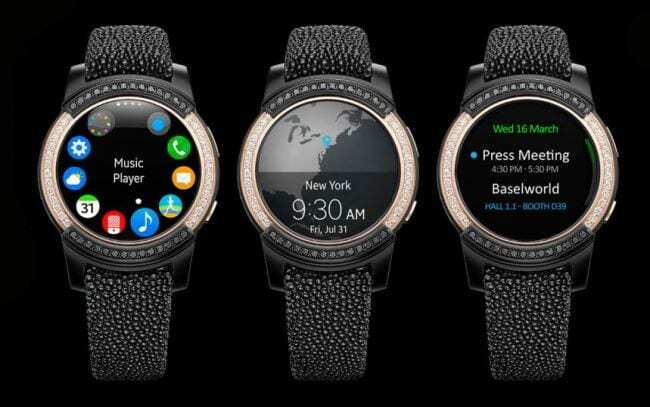 Next articleSamsung Gear S2 receives software update in UK and Sweden, T-Mobile US Hints soon.